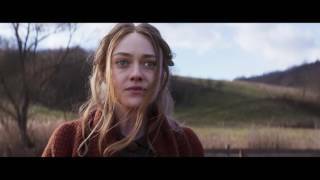 Brimstone (film, 2016). A 2016 western thriller film with "R" rating by Momentum Pictures (USA). Directed by Martin Koolhoven. Official Trailer. Brimstone is a 2016 western thriller film directed by Martin Koolhoven. Liz lives with her husband Eli and two children in the old west, one of which is a boy from her husband's prior marriage, and the other is a young girl. Liz is a midwife who can hear but communicates through sign language. A new minister comes to their church, and the moment that Liz hears his voice, she seems to recognize him and is terrified. The same day Liz is forced to choose between a delivering a baby safely or saving its mother, and the father Nathan blames and threatens Liz. After Eli's sheep are killed, he seeks out Nathan, who has disappeared. Liz then sneaks off at night to kill the minister, and finds her daughter's doll in the minister's bed. The minister disembowels Eli, and leaves him to die. Eli tells his son Matthew to take the family up into the mountains to Eli's father, before the boy shoots him. Liz and the children flee the farm. A young girl named Joanna walking through the desert is picked up by a Chinese family. In the mining town of Bismuth, she's sold to a brothel owned by Frank. Joanna is first protected by Sally until she is hanged for shooting a violent customer, and then Elizabeth. After Elizabeth bites the tongue of an abusive customer, her tongue is cut off in punishment. Joanna teaches Elizabeth sign language from a book the doctor gave her. Elizabeth plans to sneak out of Bismuth to find a new life, and arranges through a marriage broker to marry Eli. The minister comes to the brothel and becomes violent with Joanna. Elizabeth saves Joanna and is killed by the minister. Joanna slashes his throat and runs away, cutting off her own tongue and taking Elizabeth's place with Eli. The film Brimstone was scheduled to be released by Momentum Pictures (USA) on September 3, 2016 (Venice), on January 12, 2017 (Netherlands), on March 10, 2017 (United States), on July 21, 2017 (Turkey) and on November 30, 2017 (Germany). The duration of the film is 148 minutes. The film grossed over $2.1 million. Brimstone got average rating from critics. But the audience likes the film.